If vodka is your poison, then Blue Ice has the perfect solution for your next happy hour with three new ‘Heisenberg’ inspired bottles. Coloring outside the lines, each bottle is emblazoned with a memorable quote from one of our generation’s greatest villains. I think this collaboration between Sony Pictures Television and 21st Century Spirits is a collector’s dream – what do you think? 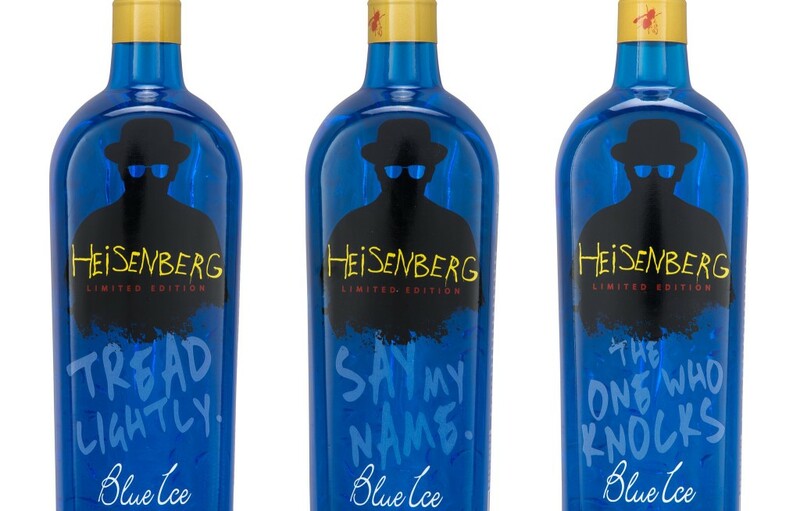 Sony Pictures Television and 21st Century Spirits have partnered up to launch a limited edition line of “Heisenberg” Blue Ice Vodka – inspired by the hit television series, “Breaking Bad.” Three special edition bottles of Heisenberg by Blue Ice, with distinct graphics and infamous quotes, are due to hit store shelves early summer 2015. Blue Ice Vodka is handcrafted in Idaho and made from premium, all-natural ingredients. Blue Ice Vodka uses continuous column distillation, combined with a patented five-stage filtration process making it among the purest products in the marketplace, today; leading to a gold medal at the 2014 San Francisco Spirits Competition and 94 points from the Beverage Testing Institute. Founded in 2002, Blue Ice Vodka is the #1 selling handcrafted, premium, American, potato vodka in the country. Blue Ice was designed for the vodka purist, with a refined palate, using only the highest level of ingredients: Idaho Russet Potatoes and pristine water sourced from the largest volcanic aquifer in the country. Blue Ice Vodka does not add sugar and is certified gluten-free and Non-GMO.